Many home chefs are deterred from whisk-intensive recipes such as mayonnaise because they seem to require more than two hands—which is obviously the maximum number we possess. One hand is required to stabilize the bowl, another must be whisking constantly... and a third hand is needed to pour a steady stream of oil. Doing all of these steps at once is physically impossible, and trying to divide the steps by pouring then whisking risks the fluidity and velvety texture of the finished product. Modern appliances, such as a standing mixer or an electric whisk, are an excellent solution to our lack of extra appendages. 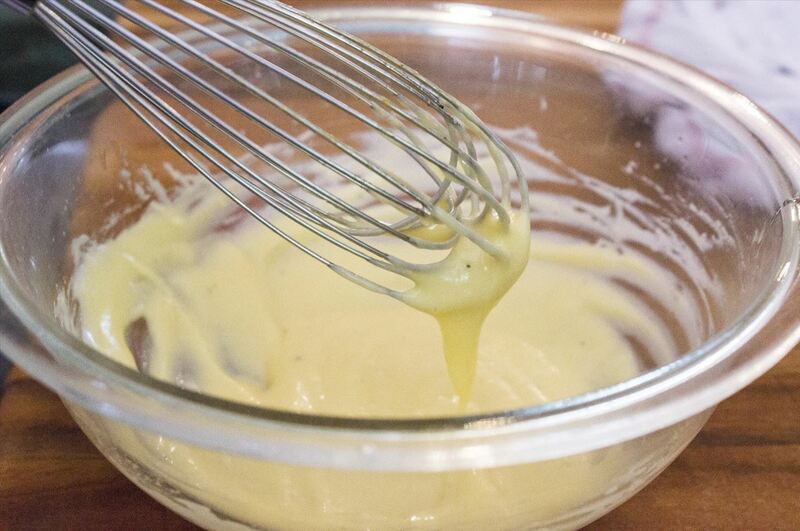 Many chefs like Simon Hopkinson go one step further to say that the key to homemade mayonnaise is an electric whisk. 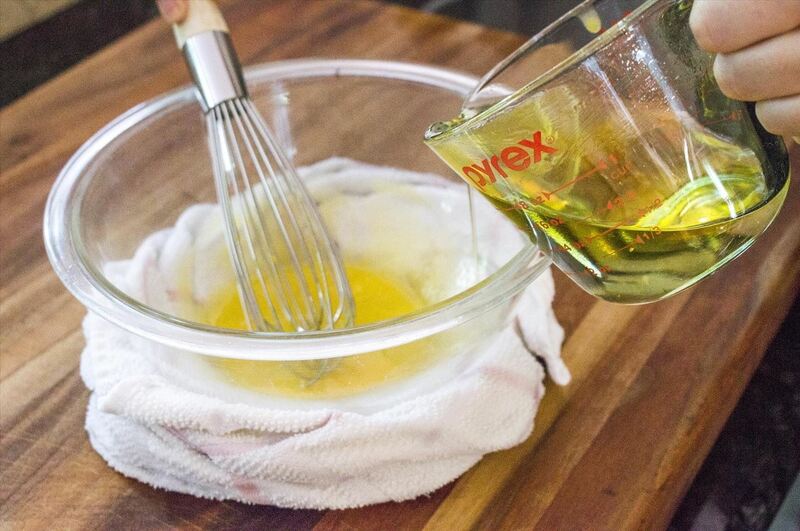 He's right, in a way: using an electric whisk paired with a narrow beaker or a stand mixer with a fitted base bowl eliminates the need to stabilize a bowl with your hand. 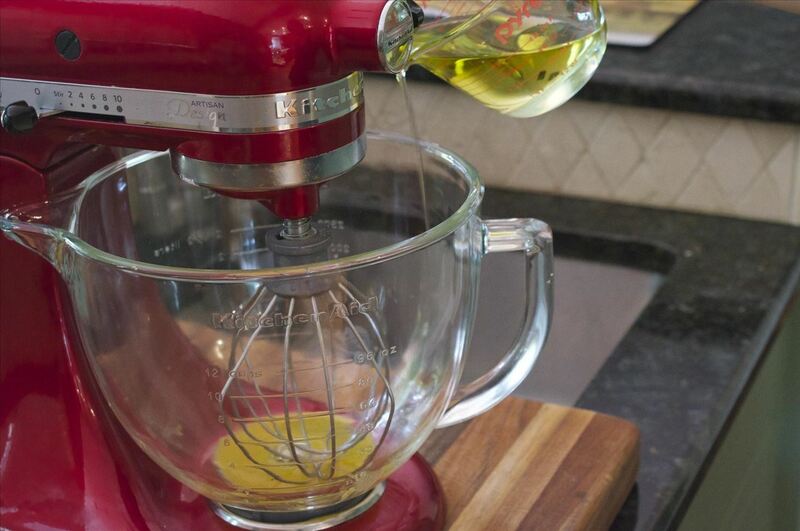 But many home chefs may not have an electric whisk or stand mixer at their disposal. If you happen to fall in this category, then these two appliance-free hacks that will give you total control over your bowl, whisk, and ingredients without requiring you to grow an extra limb (or spend next month's rent on a standing mixer). One of the biggest frustrations with making sauces and batters is trying to whisk the ingredients together in a rounded bowl while the bowl rolls all over the countertop. Unfortunately, a flat-bottomed bowl cannot be substituted because lumps may form in the corners where the rounded sides meet the bottom. 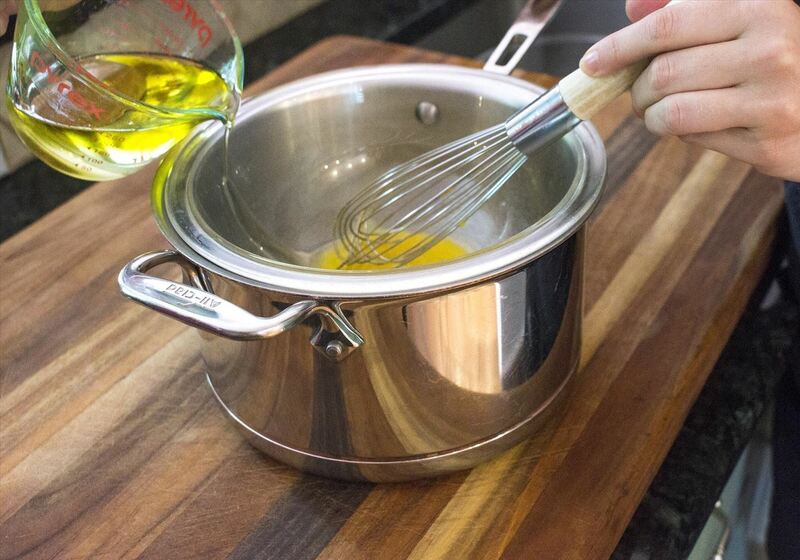 By fitting your bowl into a saucepan so that the rim just hangs over the sides, a flat surface is achieved while still maintaining the rounded bottom necessary for a smooth product. No more slip-sliding around the counter: now you have both hands free for the other components! The trouble with the saucepan hack is that it relies on having two otherwise unrelated kitchen items fit perfectly together. However, this next technique will work well in any kitchen—no matter how sparse the equipment. Run a tea towel under the tap, then wring it out lightly while still leaving it generously damp. Shape it into a small ring on your countertop and nestle your bowl into the ring. 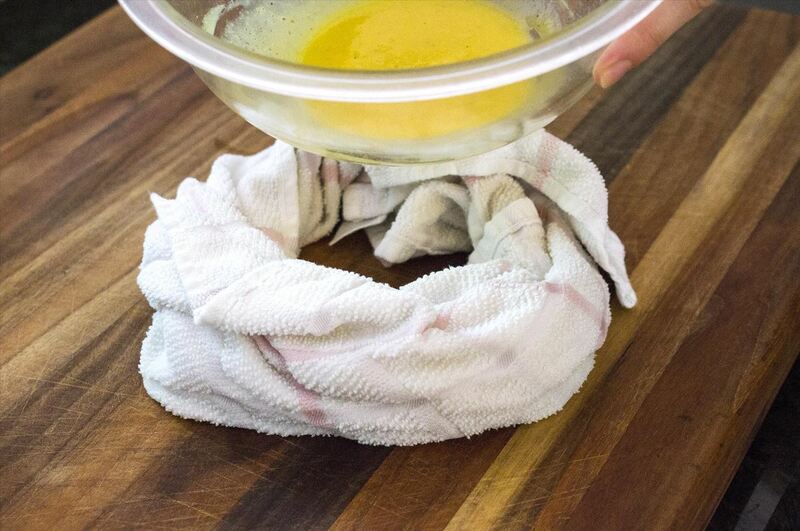 Much like our paper towel/cutting board hack, the damp tea towel will stabilize the bowl, leaving your hands free to whisk and pour simultaneously—or even sneak a quick sip of water. All of that whisking works up a sweat! Many cooking supply stores like Williams-Sonoma or Sur La Table provide utensils that are made for the sole purpose of stabilizing bowls, such as the Stabowlizer. But there's no need to spend on another kitchen gadget when you can improvise with household items. Wrinkled plastic wrap can be molded into an adhesive ring between your bowl and granite counters. Another great, inexpensive tip is to use leftover shelf liner to create a no-slip surface that'll keep your flat-bottomed bowl in place. 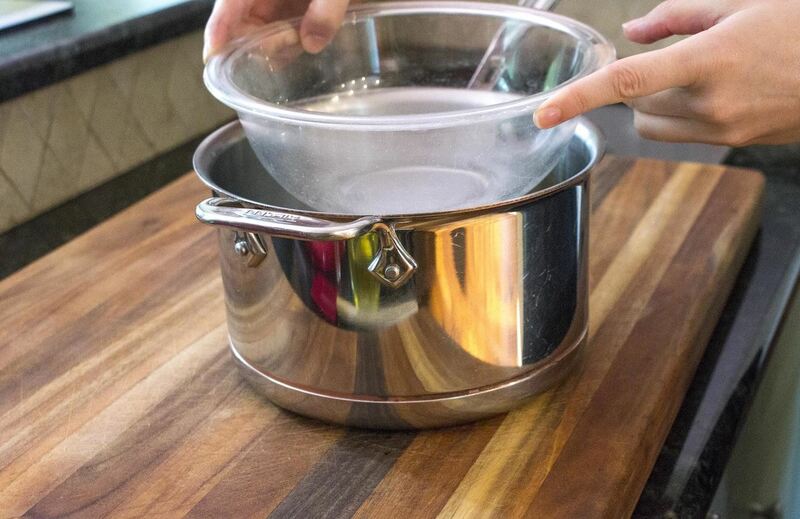 Regardless of what kitchen equipment you may or may not have, with these hacks, you'll be able to whisk up a smooth product—no extra limbs necessary! How To: Make a Filipino dessert "Food for the Gods"